For the online multiplayer mode, see Turf War. Ink to save the world! Turf War is the final boss of the Octo Expansion. At 3:00, five hyperbombs in light blue will drop at the chest area of the statue. At 2:30, five hyperbombs in green will drop at the neck. At 2:00, five hyperbombs in yellow will drop at the back. At 1:30, five hyperbombs in pink will drop at the right arm. At 1:00, ten hyperbombs in dark blue will drop at the head. Due to the statue's sheer size, the map of the stage is displayed on the screen during the battle as opposed to being viewed when pressing and rotates around depending on where the player is compared to the usual maps that have a fixed view. Hyperbomb locations will be marked on the map as they are dropped and can be seen through walls, and a tally of the hyperbombs that have been activated will be listed so the player can keep track of how many are left. "Agent 8 covered the massive weaponized statue in ink...". This does not prevent the player from getting the Octo Shot Replica, playable Octolings or the Inner Agent 3 fight. The start of the boss battle displays a screen similar to the start of a multiplayer match (complete with a minor-key version of the Splatfest match start theme), with Turf War being the mode, "Defend Inkopolis from ultimate doom!" being the objective and the NILS Statue being the stage. If the player fails to activate all the bombs before the time runs out or falls into the water, the game continues to show the aftermath, where the NILS Statue destroys Inkopolis with characters reacting to it. The image of Inkopolis getting covered by the goo from the laser is viewed from the same angle as the start-up screen. This is the first time in the Splatoon series where the consequences of the player failing a final boss are shown. After detonating the last hyperbomb, supporting characters will continue to make comments until there is no time left for the next line to be displayed in full. To view all the comments, players need to detonate all bombs with approximately 28 seconds left or more. When Pearl fires off the Killer Wail to counter the laser from Commander Tartar, a screen displaying the turf percentages pops up, identical to the prompt that appears at the end of a Turf War, where Pearl wins by 888.8%, resulting in the meter that shows the percentages breaking, similar to a Ranked Battle meter. The meter cracks and breaks in sync with the music. During Pearl's Killer Wail, Octoballs can be seen flying out of the NILS statue despite the fact they are not seen anywhere in Splatoon 2. The mission's objective text that is displayed after the battle begins, being "Ink to save the world! ", is only displayed in the first attempt of fighting the boss and is not shown again when choosing to retry it after failing. This is the case for subsequent replays of the escape sequence post-game as well. 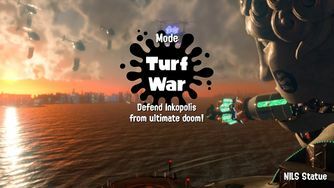 The place that the battle happens is known as Inkopolis Sea. In the background of the startup screen, it is just about possible to see Inkopolis Tower and Deca Tower. In the Latin American version during the rap battle, Pearl says: "Los licantropos no pueden contra los vampiros"(The werewolfs cannot fight against vampires), referring to the Vampire vs. Werewolf Splatfest, which Team Vampire (Pearl's team) won. Marina: Hyperbombs incoming! Dropping five on its chest! Cap'n Cuttlefish: Let's go! INK IT UP! Tartar: Bzrrt... Submit to your destruction. Your time is over, semi-sentient seafood. Cap'n Cuttlefish: Agent 8! Take a break near the point on its neck! Marina: Thirty seconds! Dropping five around its neck! Tartar: BZRRT! You will be blended up into the raw material of the new world! Cap'n Cuttlefish: Ya hear that, Agent 8? Move on over to its back! Marina: Sixty seconds! Dropping five on its back! Tartar: B-b-zrrt... This world will be reconstituted, and the professor's dream fulfilled. Pearl: Yo, Eight! Get to the statue's right arm. Stay focused and don't mess up! Marina: Ninety seconds! Dropping five on its right arm! Tartar: B-BZRRT... Cease, number 10,008! You cannot hope to defeat NILS! Cap'n Cuttlefish: Use the ride rail and head for its head! Marina: Two minutes—this is it! Dropping 10 on its head! Tartar: B-B-ZRRT! The time is nigh, NILS! THIS WORLD MUST BE PULVERIZED! Marina: Thirty seconds until it unleashes enough energy to destroy the entire world! Pearl: There's one hyperbomb left! Marina: The statue has stopped charging! Cap'n Cuttlefish: Agent 8! Stay there until we're ready! why didn't you name them princessbombs? Marina: Um...because I invented them? Marina: DJ_Hyperfresh spinning beats like ZOOM! See my hyperbombs blowing up like BOOM! Marina: ¡La efigie pastificadora dejó de acumular energía! Capitán Jibión: ¡Aguanta ahí hasta que estemos listos! Perla: Oye, y ¿por qué "bombas MRN"? ¿Por qué no "bombas Princesa"? Marina: Pues... ¿porque las inventé yo? Marina: ¡DJ MRN con las bombas que explotan! ¡Traigo tantas que nunca se agotan! Different highlights spots revealing the hyperbombs' locations. Pearl with her special weapon charged before use. The initial clash of the lasers. An image of Inkopolis getting covered in the goo from the laser. Kyodaina teki kara nawabari o mamore! Defend your turf from a gigantic enemy! Ink, ink, ink it up! Verdedig je territorium tegen een reusachtige vijand! Defend your territory against a gigantic enemy! Dispute son territoire au colosse ! Fight for territory at the colossus! Verteidige dein Revier gegen einen gigantischen Gegner! Defend your turf against a gigantic enemy! Color, color and color even more! Difendi il tuo territorio da un enorme nemico! Defend your territory from a huge enemy! Conquista el territorio de un enemigo colosal. Conquer the turf of a colossal enemy. ↑ Het hoofd boven water houden (and variations of it) is a Dutch phrase for "to stand one's ground". ↑ A più non posso means as much as possible, while polpo means octopus. This page was last edited on 9 April 2019, at 17:21.